Chartier «Créateur d'harmonies» / News / Actualities / L’essentiel de Chartier wins in China Best Cookbook in the World – Innovation Category! L’essentiel de Chartier wins in China Best Cookbook in the World – Innovation Category! François Chartier, Quebec’s “Créateur d’harmonies” shines abroad once again, this time with his book: L’essentiel de Chartier – L’ABC des harmonies aromatiques à table et en cuisine! A talented sommelier renowned for his high quality wines created in Europe and his pioneering research in “Molecular harmonies and sommellerie” on food and wine flavours, Chartier consolidates his global gastronomic fame by winning the Best Cookbook in the World – Innovation Category title awarded at the Gourmand World Cookbook Awards 2016, the “Oscars” of cookbooks. 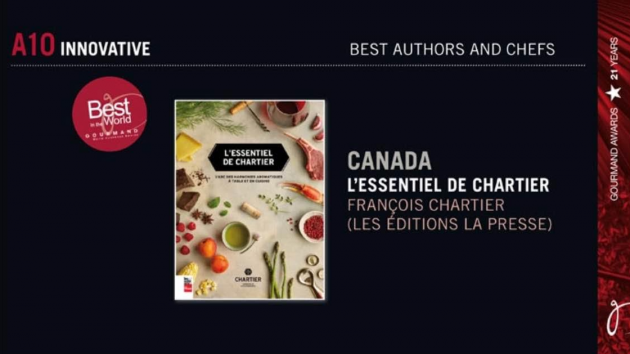 The international jury of Gourmand World Cookbook Awards, an international competition recognizing the best culinary books, awards the coveted title of L’essentiel de Chartier (Éditions La Presse) after being awarded the title of Best Cookbook in Canada in 2015. Awarded in China during the world finale’s gala on Sunday, May 29, 2016, the prestigious award rewards one winner per category among 209 candidates from participating countries. François Chartier won the same title in 2010 with his reference book Papilles et Molécules, as well as Best Wine and Food Harmonies Books in the World for his books from Collection Papilles pour tous in 2013 both published by Éditions La Presse. Such a hat trick has never been done in the 20 years of this “Oscars” for cookbooks! L’essentiel de Chartier – L’ABC des harmonies aromatiques à table et en cuisine (Éditions La Presse) is available in libraries.